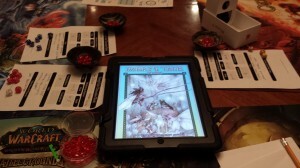 My Rise of the Runelords, Pathfinder game is tomorrow night, and we are on Session 5. 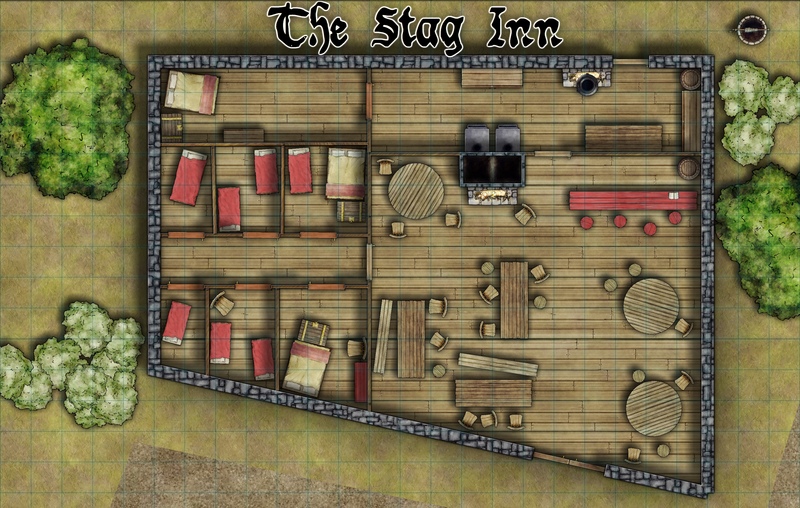 Last week the party had to move to a new inn since the one they were staying in burned down. 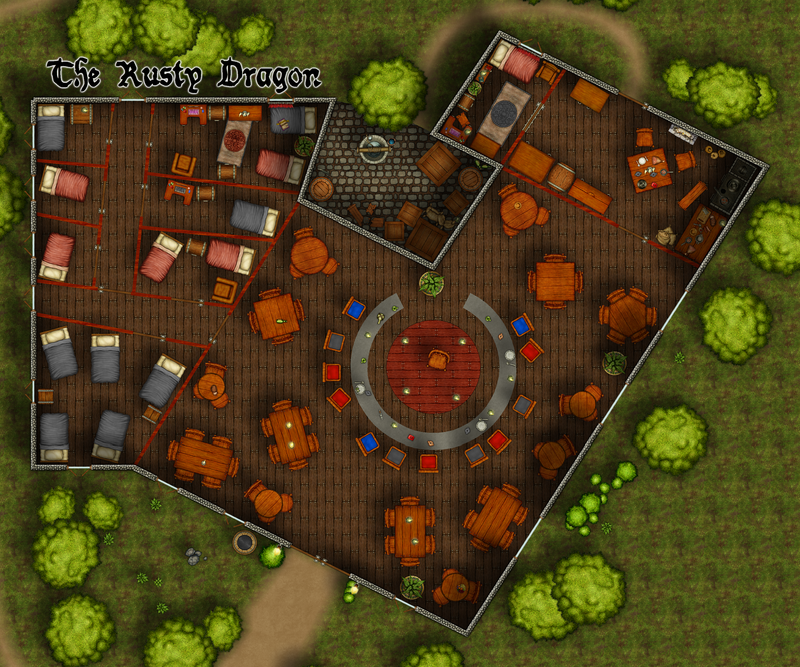 So they took up lodging at The Rusty Dragon, which just happened to be next door to their old inn. I found a really nice map online to use that was made specifically for this inn, but it is a large file and it would not load for at least one of my players. 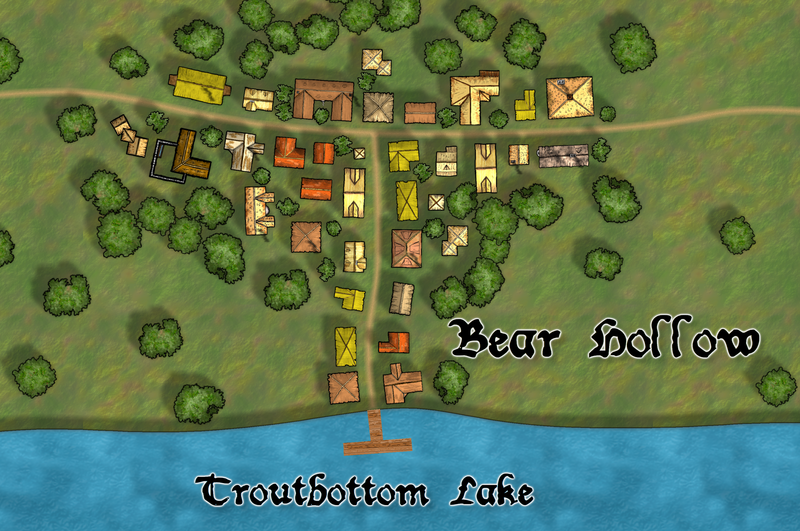 That prompted me to go ahead and make a new map using CC3. 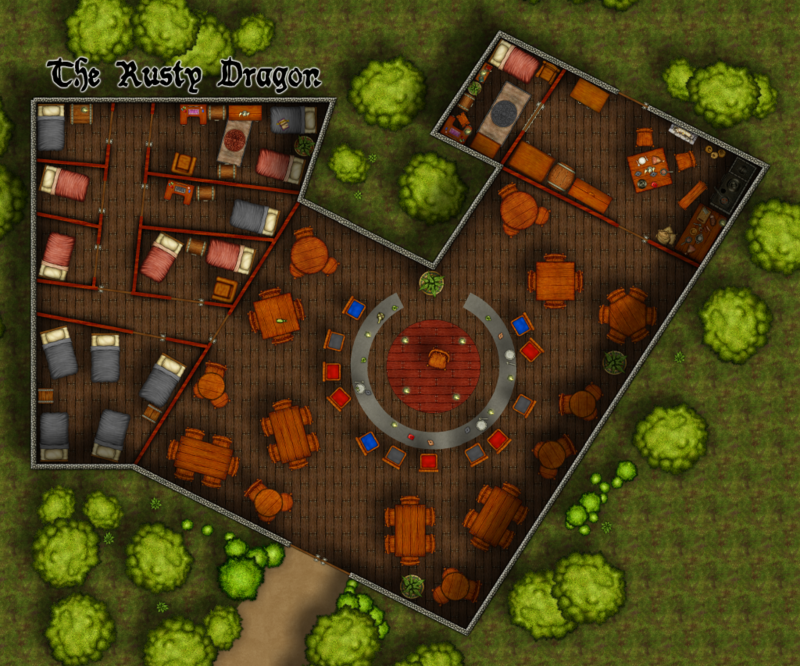 I based the foundation of the inn on the map that was provided with Rise of the Runelords, so the inn size should be pretty accurate. I only did one floor however, even though I am sure there are at least two floors. 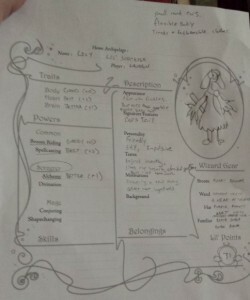 The owner is also a bard that plays for her patrons each night. So what I decided to do was make a round stage in the center of the room, that had a stone bar that goes all the way around it. My idea here is that the owner would serve drinks at the bar, then when she decides to play, she can just hop up on the stage behind her and play for the crowd. The rest of the main hall is full of tables. Then you have the kitchen to the back and the lodging rooms to the left side of the inn. The rooms range from a cheap common sleeping area to a couple of nice private rooms in the back. Since I bought CC3 I have spent a lot of time playing around with its features, watching tutorials, and trying to figure out what all I need for the different games I am playing. One thing that kept coming up, I even mentioned it in my previous post, was my need for several maps of cities. Mainly because my Pathfinder campaign was fighting off a goblin raids throughout many different places in the city. So I decided to go ahead and dive right into the Profantasy software and bought City Designer 3 as well. I am glad I did, it has a lot of good stuff in it and it has definitely made mapping cities a lot easier. I made this map very quickly and easily with the software. It is for a play by email game I am playing with one of my buddies. I enjoyed making it and feel like it is a pretty good map, especially considering it is my first city map using CD3. The software was definitely worth the investment. Let me know what you think. 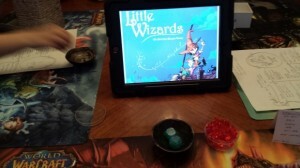 I started playing with a new online group again this year and have enjoyed the first three sessions so far. 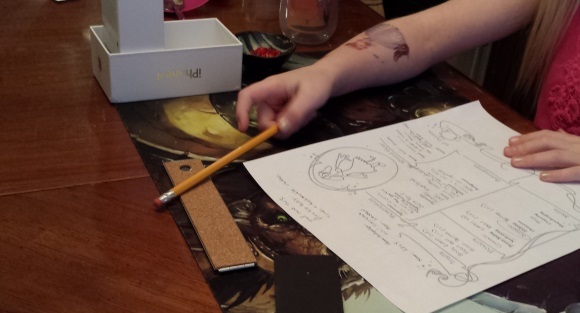 GMing for a new group, using a game like Pathfinder, has really made me remember the importance of maps. 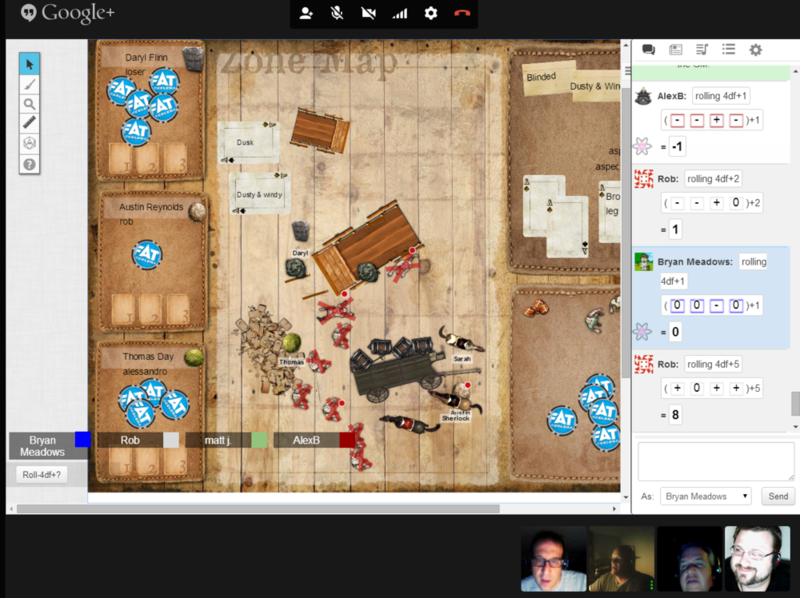 I’ve been playing with a group that doesn’t really utilize battle maps with games where they don’t really matter for so long, that I am out of practice. It excites me though because I always used to love making maps. I always sucked at it, but I still enjoyed it. After a few days of me trying to make maps on my own in MyPaint, I realized that yep, I’m still no artist. So I decided to use some Christmas money and buy a mapping program. The first program I decided to go buy was Dundjinni. I had always liked the program and had considered buying a few a years ago, but never did. After looking at the maps that it could produce, I once again decided to give it a try and downloaded the demo and played with it for a bit. Once again I liked it and went to buy it and then I found out something unpleasant. It was no longer for sale! It seems the owner went MIA a year or so ago and no can buy it anymore. Made me sad to have the money in hand ready to give it to someone and not be able to. 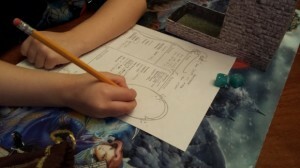 Then I went over to Profantasy and started looking at Campaign Cartographer 3. I had also liked this program before but didn’t consider it at first because it is (edited for clarification) more expensive and, I felt, more of a professional’s piece of software, and I am far from a professional. However, after talking with the community and looking through some of the items, I decided to buy it. I also picked up Dungeon Designer 3 as well and then I started watching the tutorials. And boy, and I glad I did! It has nice user made tutorials by the way, you should check them out if you are interested. However, I did run into a problem when I couldn’t get it to work properly on my Windows 7 64 laptop. I could install it and run it, but if I tried to create a new file, it dumped me out every time. I tried everything they had listed in the forums as fixes, but nothing worked. I have put in a ticket to the support guys but haven’t heard anything yet. (It has only been a day or so, and over the weekend, so I didn’t expect to.) Then I decided to give it a try on my Linux laptop using Wine and guess what, it worked with no problems. I didn’t even have to do anything special. Anyway, I hope to get that sorted out soon as well. That being said, I am absolutely loving CC3 and DD3. It is a great piece of software that makes sense and is much easier to use that I have been led to believe. Yes it has a higher learning curve, but just after a few video tutorials I was able to make the map you see below. I think anyone could learn to use this software well. Hats off to Profantasy for a good piece of software that is worth the money! So the first map I decided to make was, naturally, an inn. Because let’s be honest, you can never have too many inns. I mean, your PC’s are always itching to go to an inn and decide what to do next. 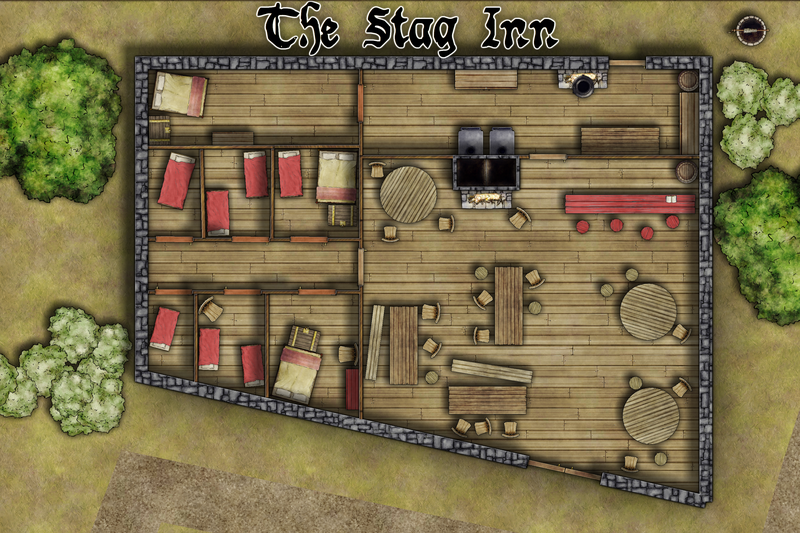 I decided to name it The Stag Inn, since it is close to the name of one of the inns in the city the players are currently in, and I think I can just transplant them to it. Please take a look and tell me what you think. 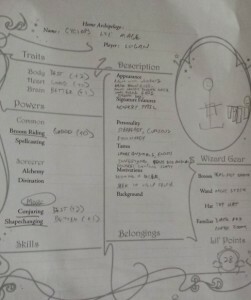 I used Dungeon Designer 3 to make the entire thing. I’m happy, but still need to figure out how to do a few things, like make the road look more like a road and connect some of the corners of the walls better. Download the full version without a grid here, and with a grid here. Interested in my game? Check out my Obsidian Portal page! I have started running a new game this year. I decided to go with a game that is popular and would not be hard to get players for. The game I went with is Pathfinder and am I enjoying it so far. 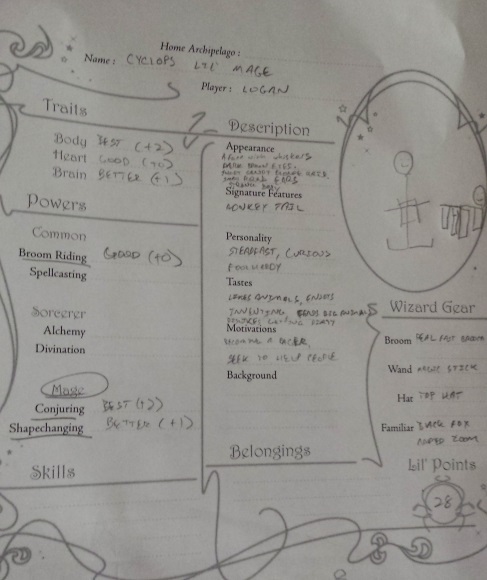 I will be posting logs and actual plays as I continue with the game. 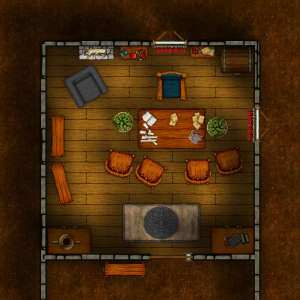 I went back to Maptool for this game, and look forward to GMing the AP Rise of the Runelords.